When we arrived at Universal Studios at around 11:30, the sun was shining and there were almost no people standing in line at the entrance. “Wonderful” I thought to myself, “if we’re lucky, it’ll be like Disney in Tokyo last year”. I couldn’t have been more wrong. As we entered the park, we realized that all the people were already inside! The lady in the ticket booth told us that if we wanted to, we should go and get a time slot ticket for the new Harry Potter part of the park. Since this was one of the main reasons why we went to Universal Studios in the first place, we hurried to the vending machine for the time slot tickets and was lucky enough to get a ticket for… 19:40 (!?). With the tickets for Harry secured, we started scouting the park. The first roller coasters we stumbled across were the two found on your right as you enter the park. With a queue time of 300 min and only 250 min to the other one, we decided to try our luck with something else. 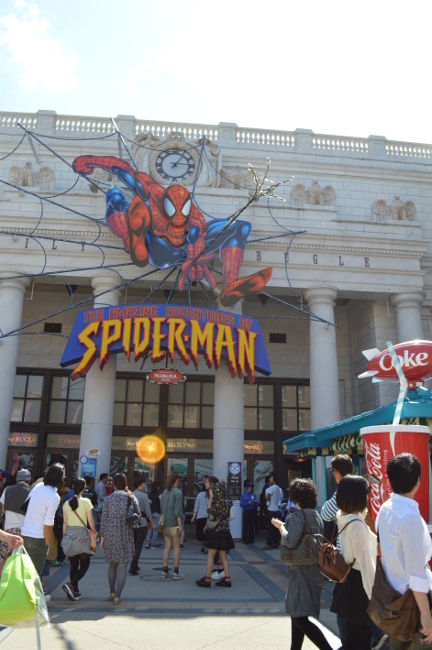 After walking around for a while, we reached the “Spiderman” ride. There was no visible queue and it didn’t have an estimated queue time. We probably should’ve realized that something was fishy at this point but we were so excited about finally finding an attractions without queues that we swallowed the bait instantly. 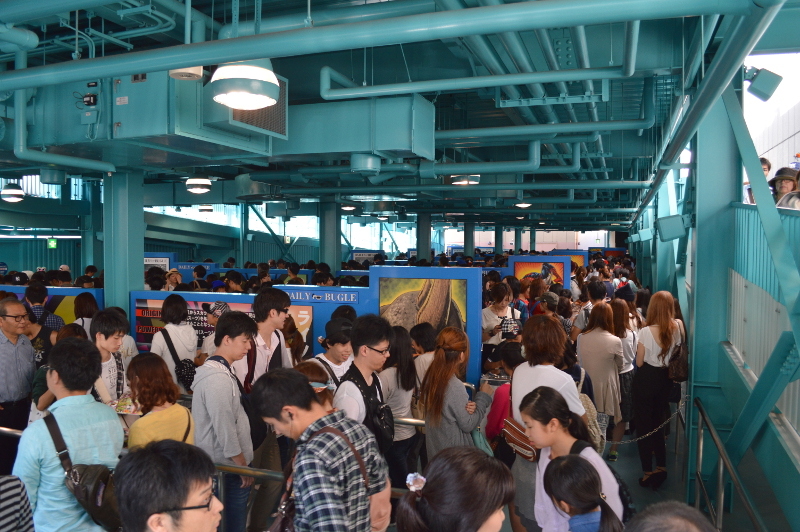 We walked in through the entrance, followed the stairs down to… the queue! “Wait a second, there are people standing in line here, but I don’t see the end of the line” Our smiles gradually turned into horrified confusion and the people behind us let out an exclamation “uso!” (loosely translated as “liar”, “you’ve gotta be kidding me”). As we exited the first (visible) “queue room”, the path lead us out to what looked like a small/medium size parking lot, but instead of cars there were people. Still with no end in sight, we continued walking up to the second floor of the people parking lot and there it was. Luckily the second floor was only half full. 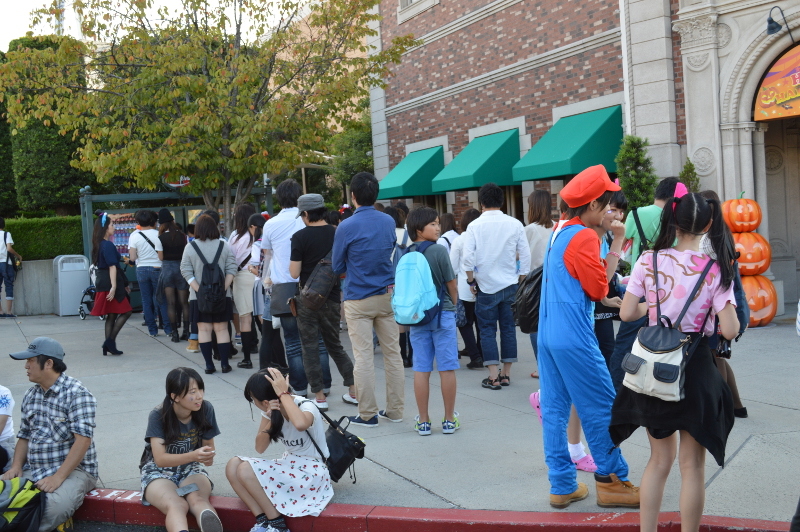 After a while we lost track of time, but we probably spent 2,5 – 3h in that queue. The ride itself was pretty darn cool but the queue time was just ridiculous. As we came out from the Spiderman ride, there were even more people inside the park. You had to stand in line for practically EVERYTHING. Want to go to the bathroom? Hope it’s not urgent because you’re gonna have to wait. Feeling hungry? “Chotto matte” (wait a little), only 20-30 min or so to get a hot dog. But the worst queue must still be the 10-15m queue to the vending machine for beverages. Look closely at the picture, there are even two lines, one for each vending machine. Instead of spending all our time in queues, we went for a stroll around the park to see the surroundings. Here and there, we found “Zombie Zone” signs as well as a couple of SWAT cars parked at the side of the streets. It looked like some kind of Halloween prop and I thought it had something to do with the fact that you could get some zombie makeup and dress up as one. After an almost complete walk-through of the park, we aimed for Wonderland, the area of small kids. It was here that we found the ride with the shortest queue time, Kitty’s Ribbon Museum! After waiting 40 min we got to see a lot of ribbons and of course, (Hello) Kitty! As we got out from the complete overdose of pink, the sun had set and the streets were swarming of people who seemed uneasy. As gunshots echoed through the streets and the crowd moved in somewhat panic-stricken, irregular motions, we heard the sound of a chainsaw. On top of a car, only 25 metres away from us stood a man waving a chainsaw around and he wasn’t alone. Another man, armed with an axe, was at is side. Then we saw them, the zombies. They were all over the place and people were screaming from both excitement and terror. For a brief moment, I thought that the guy with the chainsaw actually was a mad-man on the loose but then I realized that it was all a part of the show. Zombies walking around on the streets. It was a great zombie show! There was one zombie in particular that scared the living crap out of me. I was walking down the street with my phone in hand, fiddling with the camera settings when my husband said “Ehm Nicole… Nicole? You might wanna move this way”. “Huh? What are you saying?” I looked up, only to stare into the face of the most terrifying zombie woman. “Waaaaahhhh”, I screamed. Then I just stood there, unable to move, like a deer caught in the headlights. She hissed and growled equally loud. It felt like hours before my legs would finally move and I bravely advanced in another direction. Note to self: During a zombie apocalypse, only cannon fodder fiddles with their phone while walking. Categories: Japan, Travels | Tags: Japan, Osaka, Universal Studios, zombie | Permalink.